Whose Line Is It Anyway pits comedic actors against each other in a hilarious series of improvisational games. Scoring is random and often nonsensical. The "winner" of each episode receives the sole prize of reading the episode's closing credits in the style of the host's choosing. There€™s no curbing your laughter when Curb Your Enthusiasm star CHERYL HINES makes a guest star appearance. Hosted by comedian Aisha Tyler, cast members Ryan Stiles, Wayne Brady and Colin Mochrie, along with guest comedians Brad Sherwood and Jeff Davis, put their comedic skills to the test through a series of spontaneous improv games that are prompted only by random ideas supplied by the studio audience. The four performers must use the little information they have and their wild imaginations to depict different characters and an array of scenes, as well as perform songs. After each round of improvisation, Aisha will dole out points to our four performers and declare a winner at the end of every episode. All you need is laughter. Hosted by comedian Aisha Tyler, cast members Ryan Stiles, Wayne Brady and Colin Mochrie, along with the return of guest comedian Jonathan Mangum, put their comedic skills to the test through a series of spontaneous improv games that are prompted only by random ideas supplied by the studio audience. The four performers must use the little information they have and their wild imaginations to depict different characters and an array of scenes, as well as perform songs. After each round of improvisation, Aisha will dole out points to our four performers and declare a winner at the end of every episode. Arrow star EMILY BETT RICKARDS strikes a comedy bullseye with her guest appearance. Hosted by comedian Aisha Tyler, cast members Ryan Stiles, Wayne Brady and Colin Mochrie, along with guest Gary Anthony Williams, put their comedic skills to the test through a series of spontaneous improv games that are prompted only by random ideas supplied by the studio audience. The four performers must use the little information they have and their wild imaginations to depict different characters and an array of scenes, as well as perform songs. After each round of improvisation, Aisha will dole out points to our four performers and declare a winner at the end of every episode. Jane the Virgin star BRETT DIER won€™t arrest you for laughing with his guest appearance. Hosted by comedian Aisha Tyler, cast members Ryan Stiles, Wayne Brady and Colin Mochrie, along with guest comedian Jeff Davis, put their comedic skills to the test through a series of spontaneous mprove games that are prompted only by random ideas supplied by the studio audience. The four performers must use the little information they have and their wild imaginations to depict different characters and an array of scenes, as well as perform songs. After each round of improvisation, Aisha will dole out points to our four performers and declare a winner at the end of every episode. This week an all new episodes_4-18 of Whose Line Is It Anyway? Laughter is in your future when LEA THOMPSON makes a guest appearance. Hosted by comedian Aisha Tyler, cast members Ryan Stiles, Wayne Brady and Colin Mochrie, along with guest comedian Jonathan Mangum, put their comedic skills to the test through a series of spontaneous improv games that are prompted only by random ideas supplied by the studio audience. The four performers must use the little information they have and their wild imaginations to depict different characters and an array of scenes, as well as perform songs. After each round of improvisation, Aisha will dole out points to our four performers and declare a winner at the end of every episode. Crazy Ex-Girlfriend's RACHEL BLOOM makes a crazy, funny guest appearance. Hosted by comedian Aisha Tyler, cast members Ryan Stiles, Wayne Brady and Colin Mochrie, along with guest comedian Jeff Davis, put their comedic skills to the test through a series of spontaneous improv games that are prompted only by random ideas supplied by the studio audience. The four performers must use the little information they have and their wild imaginations to depict different characters and an array of scenes, as well as perform songs. After each round of improvisation, Aisha will dole out points to our four performers and declare a winner at the end of every episode. Proving he's no lightweight, WWE superstar wrestler CHRIS JERICHO makes a guest appearance. Hosted by comedian Aisha Tyler, cast members Ryan Stiles, Wayne Brady and Colin Mochrie, along with guest comedian Gary Anthony Williams, put their comedic skills to the test through a series of spontaneous improv games that are prompted only by random ideas supplied by the studio audience. The four performers must use the little information they have and their wild imaginations to depict different characters and an array of scenes, as well as perform songs. After each round of improvisation, Aisha will dole out points to our four performers and declare a winner at the end of every episode. Heads will roll with a guest appearance by Sleepy Hollow's LYNDIE GREENWOOD. Hosted by comedian Aisha Tyler, cast members Ryan Stiles, Wayne Brady and Colin Mochrie, along with guest comedian Brad Sherwood, put their comedic skills to the test through a series of spontaneous improv games that are prompted only by random ideas supplied by the studio audience. The four performers must use the little information they have and their wild imaginations to depict different characters and an array of scenes, as well as perform songs. After each round of improvisation, Aisha will dole out points to our four performers and declare a winner at the end of every episode. They're serving up comedy € with a guest appearance by MISTY MAY-TREANOR. Hosted by comedian Aisha Tyler, cast members Ryan Stiles, Wayne Brady and Colin Mochrie, along with guest comedian BRAD SHERWOOD and Jeff Davis, put their comedic skills to the test through a series of spontaneous improv games that are prompted only by random ideas supplied by the studio audience. The four performers must use the little information they have and their wild imaginations to depict different characters and an array of scenes, as well as perform songs. After each round of improvisation, Aisha will dole out points to our four performers and declare a winner at the end of every episode. Keeping it Real - with guest star appearance by TAMERA MOWRY-HOUSLEY - Hosted by comedian Aisha Tyler, cast members Ryan Stiles, Wayne Brady and Colin Mochrie, along with guest comedian GREG PROOPS, put their comedic skills to the test through a series of spontaneous improv games that are prompted only by random ideas supplied by the studio audience. The four performers must use the little information they have and their wild imaginations to depict different characters and an array of scenes, as well as perform songs. After each round of improvisation, Aisha will dole out points to our four performers and declare a winner at the end of every episode. Hosted by comedian Aisha Tyler, WHOSE LINE IS IT ANYWAY? features cast members Ryan Stiles, Wayne Brady and Colin Mochrie, who helped make the original U.S. version of this comedy improv series such a hit. Along with a special guest comedian in each episode, the cast members must put their comedic skills to the test through a series of spontaneous improv games.Prompted only by random ideas supplied by the studio audience and host Aisha Tyler, our four performers must use the little information they have and their wild imaginations to depict different characters and an array of scenes, as well as perform songs. After each round of improvisation, Aisha will dole out points to our four performers and declare a winner at the end of every episode.In the season premiere, they're all 'NSYNC with a guest star appearance by JOEY FATONE and guest comedian JEFF DAVIS. ALL YOU NEED IS LAUGHTER - Hosted by comedian Aisha Tyler, cast members Ryan Stiles, Wayne Brady and Colin Mochrie, along with guest comedian Jonathan Mangum, put their comedic skills to the test through a series of spontaneous improv games that are prompted only by random ideas supplied by the studio audience. The four performers must use the little information they have and their wild imaginations to depict different characters and an array of scenes, as well as perform songs. After each round of improvisation, Aisha will dole out points to our four performers and declare a winner at the end of every episode. Going for the gold with a guest appearance by Olympic athlete LOLO JONES! Hosted by comedian Aisha Tyler, cast members Ryan Stiles, Wayne Brady and Colin Mochrie, along with guest comedian Jeff Davis, put their comedic skills to the test through a series of spontaneous improv games that are prompted only by random ideas supplied by the studio audience. The four performers must use the little information they have and their wild imaginations to depict different characters and an array of scenes, as well as perform songs. After each round of improvisation, Aisha will dole out points to our four performers and declare a winner at the end of every episode. With a guest star appearance by Empire's KAITLIN DOUBLEDAY, "Whose Line" builds an empire of comedy. Hosted by comedian Aisha Tyler, cast members Ryan Stiles, Wayne Brady and Colin Mochrie, along with the return of guest comedian Jonathan Mangum, put their comedic skills to the test through a series of spontaneous improv games that are prompted only by random ideas supplied by the studio audience. The four performers must use the little information they have and their wild imaginations to depict different characters and an array of scenes, as well as perform songs. After each round of improvisation, Aisha will dole out points to our four performers and declare a winner at the end of every episode. Guest star YVETTE NICOLE BROWN (The Odd Couple) is comedy magic! Hosted by comedian Aisha Tyler, cast members Ryan Stiles, Wayne Brady and Colin Mochrie, along with guest comedian Gary Anthony Williams, put their comedic skills to the test through a series of spontaneous improv games that are prompted only by random ideas supplied by the studio audience. The four performers must use the little information they have and their wild imaginations to depict different characters and an array of scenes, as well as perform songs. After each round of improvisation, Aisha will dole out points to our four performers and declare a winner at the end of every episode. Guest star KARLA SOUZA (How to Get Away with Murder) proves you can get away with anything in comedy! Hosted by comedian Aisha Tyler, cast members Ryan Stiles, Wayne Brady and Colin Mochrie, along with guest comedian Jeff Davis, put their comedic skills to the test through a series of spontaneous improv games that are prompted only by random ideas supplied by the studio audience. The four performers must use the little information they have and their wild imaginations to depict different characters and an array of scenes, as well as perform songs. After each round of improvisation, Aisha will dole out points to our four performers and declare a winner at the end of every episode. You can't help but laugh! Hosted by comedian Aisha Tyler, cast members Ryan Stiles, Wayne Brady and Colin Mochrie, along with guest comedian KEEGAN-MICHAEL KEY, put their comedic skills to the test through a series of spontaneous improv games that are prompted only by random ideas supplied by the studio audience. The four performers must use the little information they have and their wild imaginations to depict different characters and an array of scenes, as well as perform songs. After each round of improvisation, Aisha will dole out points to our four performers and declare a winner at the end of every episode. Keeping comedy fresh with a guest star appearance by ALFONSO RIBEIRO! Hosted by comedian Aisha Tyler, cast members Ryan Stiles, Wayne Brady and Colin Mochrie, along with guest comedian Gary Anthony Williams, put their comedic skills to the test through a series of spontaneous improv games that are prompted only by random ideas supplied by the studio audience. The four performers must use the little information they have and their wild imaginations to depict different characters and an array of scenes, as well as perform songs. After each round of improvisation, Aisha will dole out points to our four performers and declare a winner at the end of every episode. It's all fun and games! Hosted by comedian Aisha Tyler, cast members Ryan Stiles, Wayne Brady and Colin Mochrie, along with guest comedian JEFF DAVIS, put their comedic skills to the test through a series of spontaneous improv games that are prompted only by random ideas supplied by the studio audience. The four performers must use the little information they have and their wild imaginations to depict different characters and an array of scenes, as well as perform songs. After each round of improvisation, Aisha will dole out points to our four performers and declare a winner at the end of every episode. Comedy never goes out of style - with a guest star appearance by CARSON KRESSLEY. Hosted by comedian Aisha Tyler, cast members Ryan Stiles, Wayne Brady and Colin Mochrie, along with guest comedian HEATHER ANNE CAMPBELL, put their comedic skills to the test through a series of spontaneous improv games that are prompted only by random ideas supplied by the studio audience. The four performers must use the little information they have and their wild imaginations to depict different characters and an array of scenes, as well as perform songs. After each round of improvisation, Aisha will dole out points to our four performers and declare a winner at the end of every episode. Hosted by comedian Aisha Tyler, cast members Ryan Stiles, Wayne Brady and Colin Mochrie, along with guest comedian KEEGAN-MICHAEL KEY, put their comedic skills to the test through a series of spontaneous improv games that are prompted only by random ideas supplied by the studio audience. The four performers must use the little information they have and their wild imaginations to depict different characters and an array of scenes, as well as perform songs. After each round of improvisation, Aisha will dole out points to our four performers and declare a winner at the end of every episode. BILL NYE proves that comedy is a science with his guest appearance. Hosted by comedian Aisha Tyler, cast members Ryan Stiles, Wayne Brady and Colin Mochrie, along with guest comedian Greg Proops, put their comedic skills to the test through a series of spontaneous improv games that are prompted only by random ideas supplied by the studio audience. The four performers must use the little information they have and their wild imaginations to depict different characters and an array of scenes, as well as perform songs. After each round of improvisation, Aisha will dole out points to our four performers and declare a winner at the end of every episode. The comedy never stops. Hosted by comedian Aisha Tyler, cast members Ryan Stiles, Wayne Brady and Colin Mochrie, along with guest comedian BRAD SHERWOOD, put their comedic skills to the test through a series of spontaneous improv games that are prompted only by random ideas supplied by the studio audience. The four performers must use the little information they have and their wild imaginations to depict different characters and an array of scenes, as well as perform songs. After each round of improvisation, Aisha will dole out points to our four performers and declare a winner at the end of every episode. This week an all new episode of Whose Line Is It Anyway? The comedy never stops. Hosted by comedian Aisha Tyler, cast members Ryan Stiles, Wayne Brady and Colin Mochrie, along with guest comedian GARY ANTHONY WILLIAMS, put their comedic skills to the test through a series of spontaneous improv games that are prompted only by random ideas supplied by the studio audience. The four performers must use the little information they have and their wild imaginations to depict different characters and an array of scenes, as well as perform songs. After each round of improvisation, Aisha will dole out points to our four performers and declare a winner at the end of every episode. They can and they did - with guest star appearance by Golden Globe winner GINA RODRIGUEZ (Jane the Virgin). Hosted by comedian Aisha Tyler, cast members Ryan Stiles, Wayne Brady and Colin Mochrie, along with guest comedian JEFF DAVIS, put their comedic skills to the test through a series of spontaneous improv games that are prompted only by random ideas supplied by the studio audience. The four performers must use the little information they have and their wild imaginations to depict different characters and an array of scenes, as well as perform songs. After each round of improvisation, Aisha will dole out points to our four performers and declare a winner at the end of every episode. Guest star and UFC Heavyweight Champion RANDY COUTURE wrestles for laughs. Hosted by comedian Aisha Tyler, cast members Ryan Stiles, Wayne Brady and Colin Mochrie, along with guest comedian JONATHAN MANGUM, put their comedic skills to the test through a series of spontaneous improv games that are prompted only by random ideas supplied by the studio audience. The four performers must use the little information they have and their wild imaginations to depict different characters and an array of scenes, as well as perform songs. After each round of improvisation, Aisha will dole out points to our four performers and declare a winner at the end of every episode. Guest star and talk show host KATHIE LEE GIFFORD goes from daytime to primetime! Hosted by comedian Aisha Tyler, cast members Ryan Stiles, Wayne Brady and Colin Mochrie, along with guest comedian BRAD SHERWOOD, put their comedic skills to the test through a series of spontaneous improv games that are prompted only by random ideas supplied by the studio audience. The four performers must use the little information they have and their wild imaginations to depict different characters and an array of scenes, as well as perform songs. After each round of improvisation, Aisha will dole out points to our four performers and declare a winner at the end of every episode. Illusionists and entertainers PENN & TELLER make it a magical night with guest star appearances (and disappearances!) Hosted by comedian Aisha Tyler, cast members Ryan Stiles, Wayne Brady and Colin Mochrie, along with guest comedian GARY ANTHONY WILLIAMS, put their comedic skills to the test through a series of spontaneous improv games that are prompted only by random ideas supplied by the studio audience. The four performers must use the little information they have and their wild imaginations to depict different characters and an array of scenes, as well as perform songs. After each round of improvisation, Aisha will dole out points to our four performers and declare a winner at the end of every episode. Who's laughing? Hosted by comedian Aisha Tyler, cast members Ryan Stiles, Wayne Brady and Colin Mochrie, along with guest comedian Jeff Davis, put their comedic skills to the test through a series of spontaneous improv games that are prompted only by random ideas supplied by the studio audience. The four performers must use the little information they have and their wild imaginations to depict different characters and an array of scenes, as well as perform songs. After each round of improvisation, Aisha will dole out points to our four performers and declare a winner at the end of every episode. Hosted by comedian Aisha Tyler, cast members Ryan Stiles, Wayne Brady and Colin Mochrie, along with guest comedian Keegan-Michael Key, put their comedic skills to the test through a series of spontaneous improv games that are prompted only by random ideas supplied by the studio audience. The four performers must use the little information they have and their wild imaginations to depict different characters and an array of scenes, as well as perform songs. After each round of improvisation, Aisha will dole out points to our four performers and declare a winner at the end of every episode. Also, the San Francisco 49ers VERNON DAVIS keeps comedy tight with a guest star appearance. Hosted by comedian Aisha Tyler, cast members Ryan Stiles, Wayne Brady and Colin Mochrie, along with guest comedian BRAD SHERWOOD, put their comedic skills to the test through a series of spontaneous improv games that are prompted only by random ideas supplied by the studio audience. The four performers must use the little information they have and their wild imaginations to depict different characters and an array of scenes, as well as perform songs. After each round of improvisation, Aisha will dole out points to our four performers and declare a winner at the end of every episode. Also, Glee's HEATHER MORRIS makes a gleeful guest star appearance. Hosted by comedian Aisha Tyler, cast members Ryan Stiles, Wayne Brady and Colin Mochrie, along with guest comedian Jeff Davis, put their comedic skills to the test through a series of spontaneous improv games that are prompted only by random ideas supplied by the studio audience. The four performers must use the little information they have and their wild imaginations to depict different characters and an array of scenes, as well as perform songs. After each round of improvisation, Aisha will dole out points to our four performers and declare a winner at the end of every episode. Also, Duck Dynasty's WILLIE ROBERTSON makes a guest star appearance. A new "calling," perhaps? Hosted by comedian Aisha Tyler, cast members Ryan Stiles, Wayne Brady and Colin Mochrie, along with guest comedian GREG PROOPS, put their comedic skills to the test through a series of spontaneous improv games that are prompted only by random ideas supplied by the studio audience. The four performers must use the little information they have and their wild imaginations to depict different characters and an array of scenes, as well as perform songs. After each round of improvisation, Aisha will dole out points to our four performers and declare a winner at the end of every episode. Also, Hart of Dixie's SCOTT PORTER makes a guest star appearance, as the "Hart" of comedy. Hosted by comedian Aisha Tyler, cast members Ryan Stiles, Wayne Brady and Colin Mochrie, along with guest comedian JEFF DAVIS, put their comedic skills to the test through a series of spontaneous improv games that are prompted only by random ideas supplied by the studio audience. The four performers must use the little information they have and their wild imaginations to depict different characters and an array of scenes, as well as perform songs. After each round of improvisation, Aisha will dole out points to our four performers and declare a winner at the end of every episode. Also, Jane the Virgin's JAIME CAMIL makes a guest star appearance, proving he's no stranger to comedy. Comedy queen - with guest star appearance by ADELAIDE KANE (Reign) - Hosted by comedian Aisha Tyler, cast members Ryan Stiles, Wayne Brady and Colin Mochrie, along with guest comedian JEFF DAVIS, put their comedic skills to the test through a series of spontaneous improv games that are prompted only by random ideas supplied by the studio audience. The four performers must use the little information they have and their wild imaginations to depict different characters and an array of scenes, as well as perform songs. After each round of improvisation, Aisha will dole out points to our four performers and declare a winner at the end of every episode. Hosted by comedian Aisha Tyler, WHOSE LINE IS IT ANYWAY? features cast members Ryan Stiles, Wayne Brady and Colin Mochrie, who helped make the original U.S. version of this comedy improv series such a hit. Along with a special guest comedian in each episode, the cast members must put their comedic skills to the test through a series of spontaneous improv games. Prompted only by random ideas supplied by the studio audience and host Aisha Tyler, our four performers must use the little information they have and their wild imaginations to depict different characters and an array of scenes, as well as perform songs. After each round of improvisation, Aisha will dole out points to our four performers and declare a winner at the end of every episode. In the season premiere, CEDRIC THE ENTERTAINER makes a guest appearance, and guest comedian GARY ANTHONY WILLIAMS joins the fun. Let the entertainment begin! 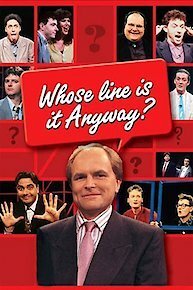 Whose Line Is It Anyway is currently available to watch and stream on Channel 4. You can also buy, rent Whose Line Is It Anyway on demand at Vudu online.